Learn the basics of using LinkedIn professionally and launch your career forward in 2012. LinkedIn is a recruiters first tool for finding job candidates. Whether you are currently looking for employment or not, it is important to have a LinkedIn profile. Come out the Algonquin Main Library for this session with speaker, author and coach April M. Williams. 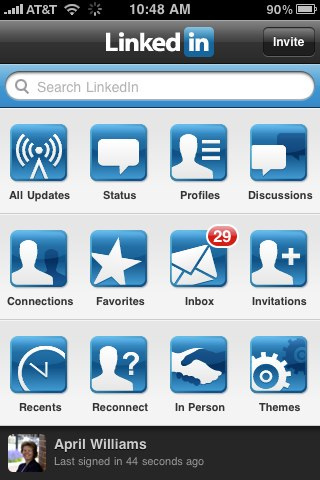 See the benefits of using Linkedin for professional networking. Determine if you are an active or passive candidate. Topics covered include basic account types, creating your profile, getting connected, and joining groups. We will cover researching companies and applying for jobs using LinkedIn tools. This session is January 15, 2012 from 2-4PM. Contact the Algonquin Library to register for this session. Reach the Algonquin Library online or call 847.458.6060. The Algonquin Main Library is located at 2600 Harnish Dr. Algonquin, IL 60102. Visit April M. Williams’ LinkedIn profile by clicking on the links below. Are you interested in McHenry County? Get the latest news in one place. The McHenry County Daily Paper published daily, brings you news from McHenry County businesses through their Facebook feeds. Visit the McHenry County Business Daily Paper for your free subscription and keep up with the latest in McHenry County news. SEE SAMPLE BELOW. Are you a McHenry County business or resident who wants to be included in the McHenry County news? Just use the words McHenry or McHenry County in your Facebook posts. We will add you to the list and your messages will appear on the McHenry County daily news. I met many McHenry County business owners at the Facebook class I taught last night. This is the first of four social networking classes in the series at the Shah Center in McHenry. Next up are classes on Twitter, blogs and LinkedIn. Here is one way to build you business page “LIKES”. Click on “comments” at the top of this article and tell us the name of your Facebook business page so we can “LIKE” it. In “website” field, enter the link to your customize Facebook profile URL we created in class last night. My custom profile URL is http://www.facebook.com/aprilmwilliams. Once you have more than 25 ‘LIKES’ on your business page, you can create your custom Facebook vanity URL for your business page. Go to http://www.facebook.com/username to select and set your URL. I will be sharing more Facebook tips on our blog. Be sure you do not miss a article, sign up for our Enews and Updates in the box on the right side of the page. Thanks for sharing. Please stop by our CyberLife Tutors Facebook page and add us to your page’s “favorites”.